Well, I can finally say it….my son is a Paladin Baseball Player! Yay!!! It is officially baseball season and I am super excited about this year! All of the nerves and stress are gone….he made it! We spent 5 days worrying about how he’d do, will he make it, and so on and so forth. It all began Friday night-we didn’t go pick him up until 9pm when he was finished. Then Saturday morning we were up at 7 to be at the school by 8am-another full day of try outs. There were time slots for every position-pitcher/catchers; infield; outfield; and hitting. Hitting was mandatory for all, but then each player would go try out at their positions, my son went out for pitcher (ofcourse), infield and outfield. This meant that we would be at PC all day Saturday and Sunday-even though at first we thought we’d have a few hours off on Sunday, the coaches wanted to see some of the boys again so we only had a 30 minute break! Saturday wasn’t too bad for us. We dropped Chris off at school and we continued on our way up to Woodbury Commons. Even though I’m broke, I still love going up to these outlets and walk around. Lots of window shopping, although I can’t complain as my wonderful hubby bought me 2 shirts at lululemon. Yay for me!! We also bought a little something at the Disney Store-this is tradition. We never miss stopping at this store and buying at least a shirt….LOL! After this, we headed back to pick up Chris. We went back home to have lunch and a bit later, returned to PC. The next morning was similar-dropped him off at a different facility, we headed to the Ice House for Kat’s skating lessons, then we went back up to pick Chris up thinking we’d have time to go home & eat. His coach wanted everyone back at the school for more outfield work, so we stopped at Wendy’s for lunch and went back to the school. Now we were really stuck….nothing to do and we weren’t sure if he’d have free time so we hung out there. We went for a walk in the woods, I jogged for a bit, we saw some deer and I took a few pictures with my phone. Eventually we went back to the car and watched movies on my ipad. Later that night he came out with a huge smile on his face! He made it through the first round of cuts! Him being on this team also means that we need to help out where we can, so we are attending a pasta fundraising dinner this Friday-should be fun! I just wish I could make it to all of the games-since I’m working full time now, I’ll miss almost all of his games. This is very depressing, since I’ve never missed his games-but I guess this is the way it has to be! Hubby should make it to more games than me, so I’ll make sure he takes the video camera!! Tonight I plan on making beef tacos for the kids while hubby and I have 2% milk with cereal. I’ll leave the weekend open since we usually order take out, and we owe our boy a dinner out. He wants to go to Tokyo Hibachi, so we may stop in there during the weekend! 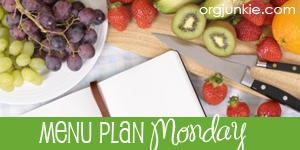 Want more menu ideas-head on over to I'm an Organizing Junkie! That’s all for now-how are your menu plans? Do your kids’ activities make it difficult to plan meals? My son is in his senior year of baseball. It will be starting soon and he will have 5 to 7 games a week. It makes it very difficult to have regular healthy meals. During the summer we travel with baseball, and spend entire days at the ballpark. Yes it is extremely hard to work around all the activities. I am so glad that your son made the team, it is very stressful to wait, for both parents and kids.